In Flanders we are still waiting for the winter as with maximum temperatures till 10 degrees, it is obviously way too warm for this period of the year. Snow we haven't seen yet so this makes it always more attractive to spend New Year Eve in the much colder Russia with family and friends of my wife. Ufa situates approximately 500km West from Siberia so snow is guaranteed. Dependent of the outside temperatures we often go walking with the children. We were lucky as only when we returned to Belgium the temperature dropped with 20 degrees to -30. This meant that during our stay we were able to let our children play in the snow, slide from the many ice- tracks, enjoy the ice- labyrinth ,... Because somebody requested to put more pictures in my articles, I added one below in which I accompany my children on a pony-trip through the snow. Visiting Russia automatically includes also distributing presents. As we didn't want to forget anybody, we almost filled up a complete suitcase with Belgium chocolate which was very much appreciated as many already ordered extra for our next visit. Once the suitcase empty it was refilled by gifts which we received. For the children there is Ded Moroz (Grootvadertje vorst) coming with candy and toys so comparable with Sinterklaas or Santa Klaus. During the holidays in our guest apartment we also get visits from family and friends which again leads to exchanging a lot of presents. An aunt of my wife brought for me the most surprising present not particularly in material value but rather because of the very personalized warm message. 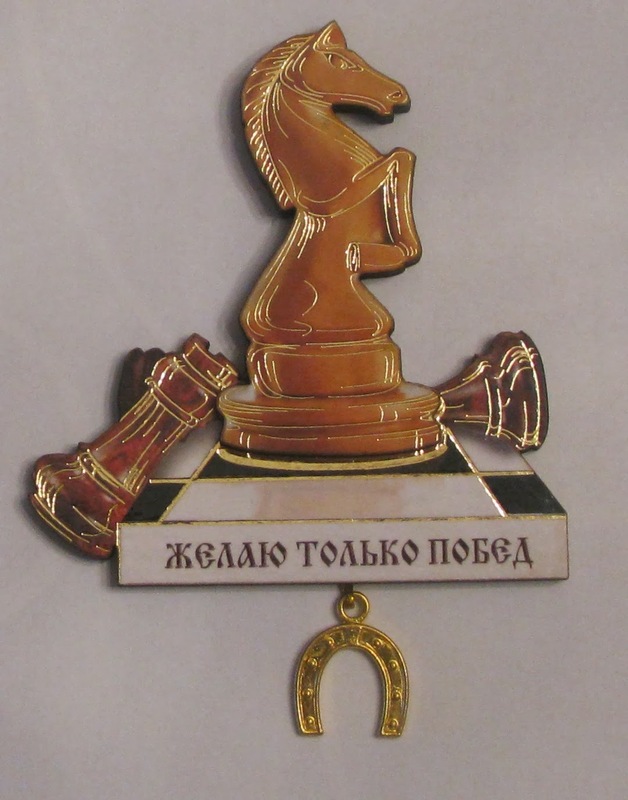 Above picture of the object shows a piece of a chessboard with knight, rook and some other toppled pieces so no doubt it is about chess. Looking more attentive, we remark a hoof which indicates a good-luck charm. The inscription is in Russian :"желаю только побед" and says "I wish you only victories". I am not at all superstitious but the fact that somebody spent time and effort in a not ordinary gift, I appreciate very much. Superstition in Russia is still very much alive. A lot of people do believe that one can influence luck by respecting some invisible powers. It is rather a sensitive subject. Easier and more concrete is to look what we can do ourselves to improve our chances. In this article I will elaborate on this. The subject was already to some extend discussed earlier see e.g. how to win from a stronger player in which I explained the chaos-theory. However this time I am more looking from the stronger player point of view. Doing the exact opposite of what the weaker player tries to accomplish is a bit too simple. Naturally it helps to sabotage their strategy but there is more what a stronger player can do. A stronger player calculates clearly quicker and more accurate. This can but not necessarily has to be based on a better pattern-recognition. There is surely some benefit in putting more calculation in a game if you are the stronger player with the condition that it doesn't become chaos so big (losing) mistakes can be avoided. If we today also take into account that a superior opening-knowledge is not guaranteed anymore for the stronger player with the available databases and opening-books to everybody then there is serious point to avoid theory as soon as possible. All very well but how does this work in practice? A comment of Bruno on my article playing the man explains this vision well: "Deviating theory probably can be done easily. However also finding variations which are fitting your playing-style and not leading to dry positions, seems much tougher". It is a good question/ remark which many players for more than a century already in vain tried to answer. Former world-champion Jose Capablance introduced in 1920 already his own variant of chess by adding 2 column and some new pieces. Former world-champion Bobby Fischer introduced a different variant of chess: Chess 960 or Fischer Random Chess which is based on the older shuffle-chess. These solutions start from the position that high level chess has no future anymore and will quietly die from draws. Kasparov laughs with this shortsightedness of Capablanca in his book Garry Kasparov on my Great Predecessors, Part 1 but makes a bit later a similar mistake by stating that today top-level chess only starts after a lot of theory-moves. Differently formulated, there is today after the obligatory theory-moves on top-level only a rather limited (uninteresting) game left in which players have to find moves themselves. I believe that this is the main-reason why a decade ago the decision was made to increase the pace of the games to find again the entertainment value. In 2004 this book was published by Kasparov and in that era this was indeed the norm. However end 2011 there was becoming a fracture in this conception as clearly was shown in an article on Chessbase. Suddenly contemporary top-players play much less theory than their predecessors. Below graphic shows the depth of the average novelty over time. The moment of change is of course connected with the raise of Carlsen. Carlsen showed the world that it is still possible to beat any player without relying on dominant opening-knowledge which is very different from his predecessors. I believe after obtaining the world-title even the last unbelievers (see the scientific approach) will now admit that they unfairly criticized his approach as inefficient and based on luck. To win games, you need to put pressure on the opponent (which even works in world-championships). Carlsen shows today that you can be at least successful (and that is likely even an under-statement) by applying a less big but longer pressure. The pressure is less big as it is not based on super-human openings (today mainly created in advance by intensive use of engines) but is rather based on the own playing skills. However by deviating much earlier from theory and on top by choosing for positions which contain lots of possibilities, the opponent is forced to do much more thinking on the board. If instead of from move 20, you need to think from move 10 then in an average game there is a 50% increase of the number of moves you need to devise yourself. So a stronger player will easier make the difference if more thinking at the board must be done. However due to our existing playing-tempo there is still a second aspect playing an important role in the success of this approach. The time for reflection doesn't depend on the number of moves one must devise. In other words, with this approach more classical oriented players are forced to think differently compared with their usual slower reflection method if time-trouble has to be avoided. They say that Carlsen plays faster than his opponents but in reality he just better takes into account that his type of play consists of making more decisions. Hereby we shouldn't forget that this strategy is even enforced if you also are technical stronger than the opponent. The stronger player can in (much) less reflection time still calculate as much as the weaker opponent using more reflection time. Carlsen's first victory in the world-championship demonstrates this philosophy pretty well. Already at move 10 Carlsen manages to introduce an unknown queen-move which certainly doesn't refute black's position but nevertheless guarantees an open fight. The reactions on twitter are self-explaining: : "This will not be a short draw." and "This looks like spectacularly unimpressive opening preparation from team Carlsen". An outsider sees mistakes from Anand which he in a normal situation will never make and thinks wrongly Carlsen was lucky. The Scottish grandmaster Jonathan Rowson describes the phenomenon on chessbase as if Carlsen manages magically to let disappear the talents of his opponent. Ok all very well but we are no Carlsen. Bruno's comment: "I have few doubts Carlsen works enormously on his openings, if just to find a good way to divert from theory." I disagree partly. It is much easier to find something playable in a side-variation than studying critical continuations. Ok still some work must be done but is not anymore necessary to study the huge amounts of theory. A player adopting this strategy successfully is the strong Armenian player IM Mher Hovhanisian (living in Belgium). That Mher isn't interested in theoretical debates, can be read already in my article an extended black repertoire. Variate in the same way with white existing openings as with black existing openings, has much less effect. Black largely defines which opening pops up on the board. It is the most important reason why preparing with black for me in general goes much faster than with white. However an advantage of having the white color is that you have more freedom in choosing moves. I mean that a slightly inferior move, doesn't lead necessarily to a difficult position. Mher also showed this in round 5 of Open Leuven in our mutual game. We were the only 2 left with 4/4 so we would decide between us 2 who would continue the tournament as leader. There was little time to prepare but that was not really necessary as after checking the database it became quickly evident that I would never be able to predict Mhers choice. Besides Mher didn't do any preparation at all in advance. In the game Mher already started to think deeply at move 2, produced the aggressive b4 and threw me out of book. After 4 moves already an original interesting position was put on the board with lots of possibilities. Afterwards Valery Maes commented that Mher was lucky but I look differently to his victory. I made indeed a blunder which I likely easily avoid in a quiet situation but it is his merit to play quicker and more efficient. Besides if I would not have made the error then still I estimate the chance high that later another error would be made under the continuous pressure. So the lucky one has made his own luck which in fact tells us that we can barely talk about luck. Finally a move like 2.b4 doesn't demand lots of preparations. It also has little sense as black has too many options and the chance to play this regularly is also rather slim. Discovering such moves is just a matter of keeping the eyes open for the non usual things. You can for example detect in an opening-book for engines that white scores 70% with b4 in 38 earlier played (master-)games. With an open mind, a reasonable memory and mainly guts there is already much to gain.